This litter is like NO others! It not only absorbs the urine in the litter, it also is the strongest clumping litter sold today. The stronger the litter clumps, means the cleaner the box after scooping. The cleaner the box means the fresher the box and your home! Place at least 3” to 4” of litter in the litter box. Most cats will dig in the litter box before eliminating. Our litter is designed to be used at a minimum of 2-1/2 inches. When the proper depth of litter is maintained, you will find that cleaning the box to be hassle free and take much less time than other litters. You will find that your scoop just floats through the box with almost no effort. 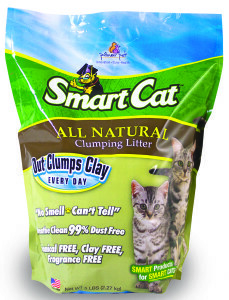 We think you and your cats will find SmartCat® NATURAL litter to be the best litter available. It will naturally attract your cat to the box. The litter is very friendly to the cats paws, they will find digging, eliminating and covering effortless. You will find cleaning and maintaining the box to be equally as simple. Enjoy using the most innovated litter ever made, your cat will THANK YOU!